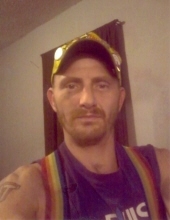 Celebrating the life of Thomas Winger, Sr.
Obituary for Thomas Winger, Sr.
Thomas Winger, Sr. age 38 of Boone, died Thursday, August 16, 2018. Per his wishes, Thomas has been cremated. A Celebration of Thomas’ Life, will be Saturday, August 25, 2018, beginning at 1 p.m. at the Boone Senior Citizens Center, 1112 Story Street. Thomas Albert LeRoy Winger Sr., was born in Mount Shasta, California, on March 17, 1980, the son of Gerald LeRoy and Princess Marie Winger. Thomas worked in construction over the years, doing everything from framing and dry walling homes, to roofing them. Thomas enjoyed fishing and making yard art with copper wire. He also like writing his own song lyrics and loved to sing them to friends and family to ask if they liked them. Thomas liked to draw and to tinker around with all of his treasures and he could grill like no other. Most of all, he liked spending time with his family and his many friends. He was preceded in death by his grandparents, Thomas Joseph Weber and Helen Marie Weber-Vienna, Samuel Vienna, and his father, Gerald LeRoy Winger. Thomas is survived by his five children, Collin Blevins of Redding, California, Thomas Winger Jr. of Ames, Katrina Winger, Keaton Winger and Brody Winger all of Boone; his mother, Princess Marie Winger of Anderson, California and his step-father, Glenn Siebert; three brothers, Obidiah Myers of Boone, Joshua Myers of Boone and Cory Winger of Anderson, California; six step-siblings, Troy, Mike, Roxanne, Vicky and Louise Winger of Oregon and Mark Siebert of Redding, California; uncle, Donald Weber of Boone and many nieces and nephews and cousins. In lieu of flowers, memorials in memory of Thomas, may be directed to the family. To send flowers or a remembrance gift to the family of Thomas Winger, Sr., please visit our Tribute Store. "Email Address" would like to share the life celebration of Thomas Winger, Sr.. Click on the "link" to go to share a favorite memory or leave a condolence message for the family.